Cuteness overload! If you're allergic to anything cute, be forewarned: This mug just might kill you! Seriously, the delightful My Little Pony 12 oz. 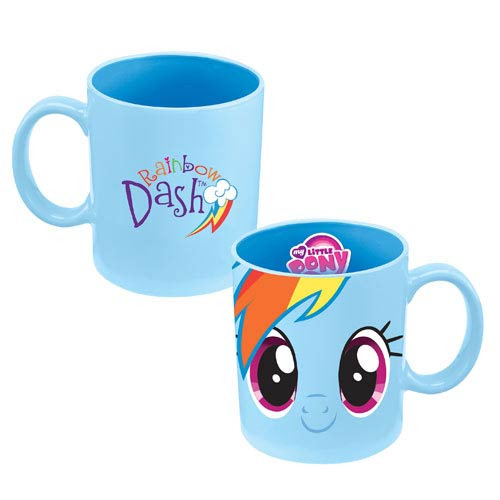 Ceramic Mug is ideal for fans of the hit show My Little Pony: Friendship is Magic, specifically Pegasus pony Rainbow Dash. Colored blue overall and made to look like Rainbow Dash's adorable and smiling face, it includes the My Little Pony: Friendship is Magic logo on the inside and the words "Rainbow Dash" on the other side. This is the cutest mug ever for drinking your hot or cold beverages! Dishwasher safe.